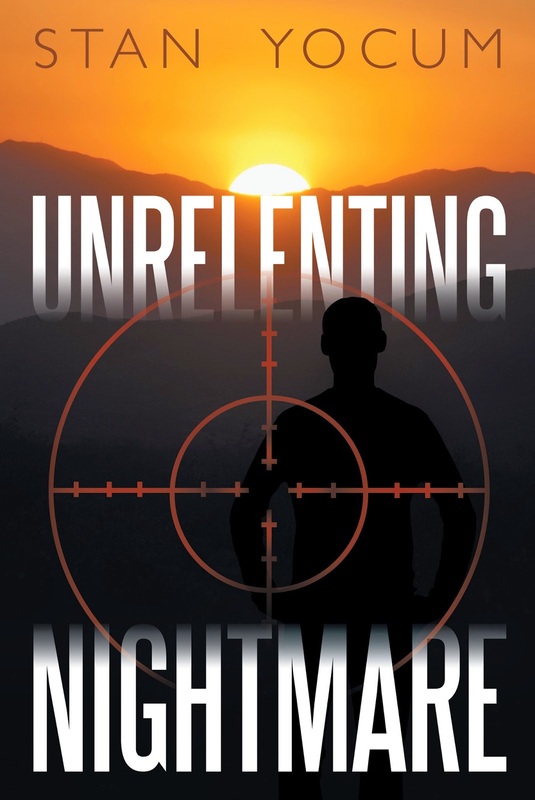 Today we are interviewing Stan Yocum, author of the suspense novel Unrelenting Nightmare. My first degree in college was in theatre arts, and I spent a number of years trying to get established in the entertainment industry as an actor. I later returned to college and received a second degree in accounting and became a CPA, spending seven years with a national accounting firm. After leaving the accounting firm, I started my own consulting practice that helped turnaround financially troubled companies. After thirty years in the business world, I returned to my artistic roots and started writing novels. I have written eight books, three of which are published. I am married, have two adult daughters and live in Palos Verdes, California. I also raise and train dogs for a national organization that provides assistance dogs for the disabled. Describe the plot of Unrelenting Nightmare in a few sentences. Stuart Garrison, a brilliant virtual reality software developer, has his company poised on the threshold of industry dominance with the release of his newest virtual reality system – Next World. Preston McBraid, the cutthroat CEO of a rival company, realizes that if he doesn’t own Next World his company is bound to lose its premier position atop the computer industry. He hires Nomed, a notorious assassin who commands millions to kill a target, and soon Stuart finds himself catapulted into a deadly cat-and-mouse game against the infamous Nomed, and only time will tell who is clever enough to survive. Readers who like suspense/thriller novels that are action-packed, with characters that you love and others that you truly hate. What was the creative process like for writing the plot for your book? I first saw a laser presentation when I was in theatre arts in the mid-sixties that projected a vision of trees onto an empty stage. The experience and imagery of that presentation stayed with me. When virtual reality began to expand beyond simple computer graphic games, I combined the two capabilities: laser imagery and virtual reality, and combined it with the dark side of the business world and created a suspenseful story full of action. What was your inspiration for the character Nomed? I wanted to create a character who was merciless, ruthless, and enjoyed assassinating his contracted targets. A man who thrived on being an assassin and the money he made from killing individuals that other people were incapable of doing. Did your background in business and theatre impact how you told the story of Unrelenting Nightmare? Definitely. I relied heavily on my acting experience in developing the character Nomed. The plot draws on the corruptness of business competition and the ruthless avenues people will take to better their position in the business world and their personal wealth. My third novel, which will be released shortly, surprisingly is a love story. I decided to venture from suspense novels and test the waters of romance. We’ll see how that turns out. My forth novel will return to the suspense genre and be released probably by the end of this year. Unrelenting Nightmare received two top awards from iUniverse: Editors Choice and Rising Star. Those who have read the book enjoy the action and suspense and have given the book high ratings in their reviews. But I’ll warn you, Nomed is one “mean” character and kills with no concern. Therefore, the story contains an abundance of people getting shot. I purposefully included that characteristic of Nomed to better define his personality, but I will still offer the warning. Mind Games was Stuart’s ultimate dream, but a dream he could achieve only if Next World proved successful, which apparently it had. He had dreamed about Mind Games for as long as he could remember. And now, finally, he had the technical capabilities, the industry influence, and, above all, the money to make that dream come true. Stuart also knew that, once he delivered Mind Games to the masses, he alone would stand at the top. For nobody would dare say they could match his vision or creative genius … without question, he would thoroughly enjoy the recognition and the power and the personal wealth this would afford him. Stuart Garrison had one additional dream. He intended to someday structure a buyout of USI, thus making him the undisputed czar of the computer industry. As the other board members continued to marvel at Next World’s financial results, Stuart sat quietly and reveled in his self-proclaimed brilliance and personal success. He knew that Next World was only a key, a financial key that would open the door to Mind Games. And once he stepped through that door, his lifelong dreams and ambitions would be fulfilled.